We have a second-year module called Exploring Futures. In this module, students research, set up and do some professional work experience and focus on articulating their ambitions for their emerging career. Students get involved in all sorts of things, from working alongside other blacksmiths, taking part in exhibitions, curating exhibitions, working in schools and hospitals. Employability is a really important part of the programme. 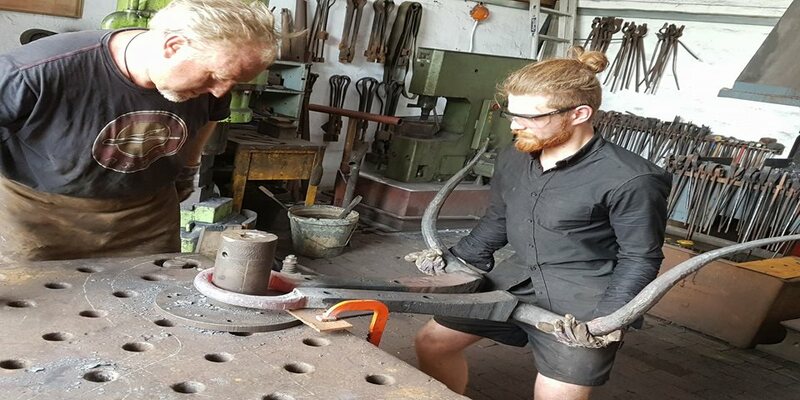 I was lucky enough in February to travel out to South Africa to spend a week working and living with blacksmith Paul Mikula, an opportunity to help him forge his most recent sculpture. Mikula’s sculptural work focuses on re-purposing old wagon axles, forged in England around the turn of the twentieth century and brought out to the colony. When ox wagons fell out of use, most of the axles were forgotten, left to rot or re-purposed as gate and fence posts. Paul has set about collecting and re-forging these wrought iron axles into works of art, representations of African wildlife such as impala, kudu, antelope and most recently an ox. The ox sculpture we worked on is one of the largest he has made and required the use of a five-hundred weight Massey for most of the forging, which is kept at his old forge. Having met him at Ypres 2016, a large blacksmithing event, I was invited to visit. Taking him up on his offer, I travelled to Johannesburg and onwards to Hartheespoort Dam, a beautifully picturesque town in the mountains. At the old forge, the water was supplied by a borehole pump which in over 30 degree heat decided to break down part way through the day, meaning we worked for about an hour with no water before we managed to fix the pump. 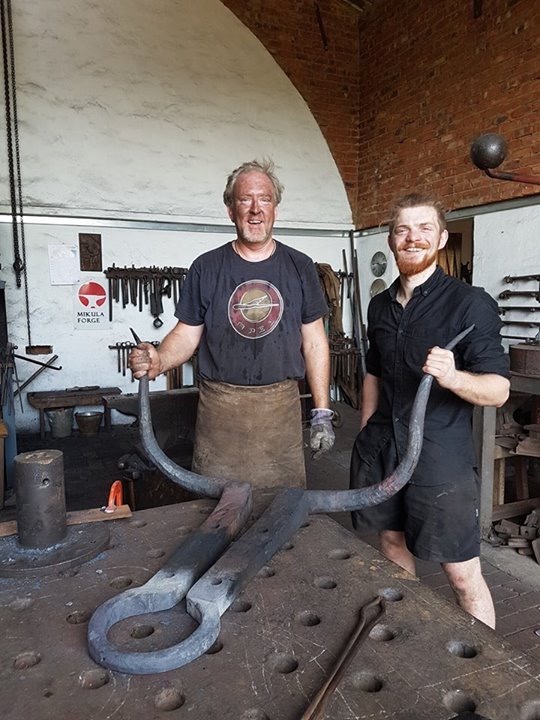 Moving back to his current forge, situated next to his house half-way up a mountain, with a view overlooking Hartheespoort Dam, we finished tapering the horns and began shaping them. Both the forge and his house rely solely on solar energy for power and rainwater for drinking and washing. South Africa is a veritable goldmine of old English colonial era machinery, which is left lying around. Paul found the majority of his machinery and kit from power hammer to anvils, in old barns and scrapyards, disused and forgotten. He is very keen on re-using what he can and staying true to the material and its history. This was particularly important in the ox sculpture we made. A one hundred and twenty year old ox wagon axle re-forged into an artistic representation of an ox, bringing the English iron almost full circle in a way. It was an incredible opportunity, not just to see some of South Africa and its wildlife, or to enjoy the sun and the barbeques, but to learn a lot about smithing, design, drawing and running a business. I have been invited back and fully intend to return as soon as possible.